10 Overused Exercise Excuses to Avoid At All Costs - Diet Happier! ​EXERCISE EXCUSES. We’ve all heard them – and we’ve all used them. ​Over the years, I’ve heard anything and everything used as reasons for neglecting one’s health and fitness. More times than not, it’s misinformation or lack of understanding that rears its ugly head and leads people to believe they can’t or shouldn’t exercise. So what follows are the top 10 excuses I’ve heard over and over throughout the years, and my responses…. EXCUSE #1: “I don’t have time to workout”- We’ve all heard this, or used it ourselves at some point. Have you? REBUTTAL: First off, it’s a ridiculous statement. Every person has the same amount of time in every day. You may be busy, but not too busy to take care of yourself. This is primarily driven by the fact that people tend to think exercise programs need to be several hours long, or 7 days a week to be effective. Not true, three hours per week is manageable, maintainable, and provides amazing health benefits. Who can’t find 3 hours in a week? EXCUSE #2: “I can’t get to or I don’t have​ the money for a gym membership”- Have you ever said this? You do not need machines, or to pay a monthly fee! EXCUSE #3: “I’m not fat, I don’t need to” – If you’ve said this, it speaks volumes about you. And maybe a lesson in humility as well. EXCUSE #4: “ I don’t like to workout” – I can change that guaranteed! First impressions in fitness are huge​. Wrap your head around the fact exercise is not a choice, it is a must. EXCUSE #5: “I don’t want big muscles” – Really? What is much more common is when women appear to have bigger muscles because they may have lost a bit of body fat, which allows the muscle they have to be seen more easily. So for all you women, no need to worry about big muscles, and guys, you should be so lucky to have a big muscle problem. EXCUSE #6: “I walk everyday”- yeah, and……..??? REBUTTAL: Walking is NOT exercise! I know – you power walk right? Walking is how we get from point A to B, so for the last time - Walking is NOT exercise! EXCUSE #7: “ I have too many injuries, or health issues”- This is super common. REBUTTAL: It is really frustrating when you can’t exercise like you used to, or without limitations. But truthfully, no matter how serious your issues are, you can still find modes of exercise to work around your injuries, or medical conditions. And you can always improve your fitness and health. Of course if you need medical clearance, you should always consult your doctor and seek the guidance and supervision of a qualified fitness professional. Believe it or not, even serious heart issues don’t necessarily always preclude an exercise regimen. No excuses. 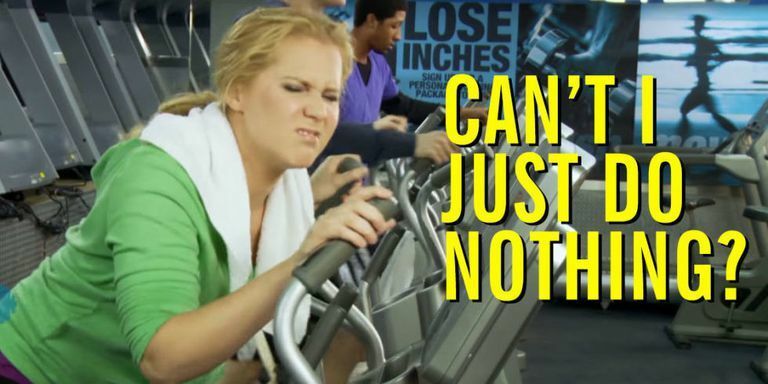 EXCUSE #8: “My spouse doesn’t like how I look when I workout”- That’s a shame in my book. REBUTTAL: Yes, it is true, I’ve heard this. 9 out of 10 times it’s because said spouse is out of shape themselves, can’t or won’t commit to exercise, and has better self confidence when their spouse joins them in an exercise free, sedentary lifestyle. That being said, I would never stop exercising, being fit and healthy or doing anything I knew that made me a better person for anyone. You’ll have more energy to chase those kids and show the boss you’re a top producer. With a regular fitness program, your body becomes more efficient at energy production and converting nutrients into fuel. It’s hard to break the cycle and start up, but once you get going you’ll feel a noticeable improvement immediately. EXCUSE #10: “My schedule is irregular and/or I travel a lot and can’t keep a regular regimen” So?? Shooting for 3 days a week is completely doe-able, even for the traveling workaholic.